INDIANAPOLIS—Amid a new scandal that many are already calling the most damaging in the history of collegiate sports, the NCAA announced Tuesday that it has launched an investigation into God, Divine Creator of Heaven and Earth, for allegedly giving gifts to student-athletes. Reports indicated that over the past several decades, the Almighty has provided hundreds of players from high-profile Division I football and basketball programs with abundant natural speed, strength, and agility, and both the universities and the players themselves are now said to be facing heavy sanctions and punishments. According to sources close to the investigation, numerous players openly and brazenly flaunted their improperly gained athletic prowesses, while further evidence revealed that many coaches and university personnel were aware that these talents were God-given, but failed to alert the NCAA. Reports confirmed that LSU, Tennessee, Notre Dame, UCLA, North Carolina, Oregon, USC, Louisville, Maryland, Rutgers, Alabama, Iowa, UConn, Boise State, San Diego State, Wisconsin, Illinois, Butler, Arkansas, Clemson, TCU, Washington State, Ole Miss, Baylor, UNLV, Vanderbilt, Syracuse, BC, Purdue, Ball State, Missouri, Wake Forest, Memphis, BYU, Pittsburgh, Duke, West Virginia, Virginia, Villanova, Kansas, Miami, Auburn, Ohio State, Penn State, Georgia, Georgia Tech, Florida, Florida State, Oklahoma, Oklahoma State, Arizona, Arizona State, Michigan, Michigan State, Texas, Texas Tech, and Texas A&M are among the over 300 schools implicated in the scandal. While the NCAA’s investigation is reportedly still in its early stages, potential punishments could be incredibly severe, including probation, the loss of scholarships, the forfeiture of wins, and, if necessary, vacating the championships of any school found to be guilty of benefiting from gifts handed down by the Lord Almighty. Sources close to the situation also told reporters that former Auburn quarterback and current Carolina Panthers star Cam Newton may be stripped of his 2010 Heisman Trophy due to a suspected connection between God and Newton’s uncanny combination of size and quickness. 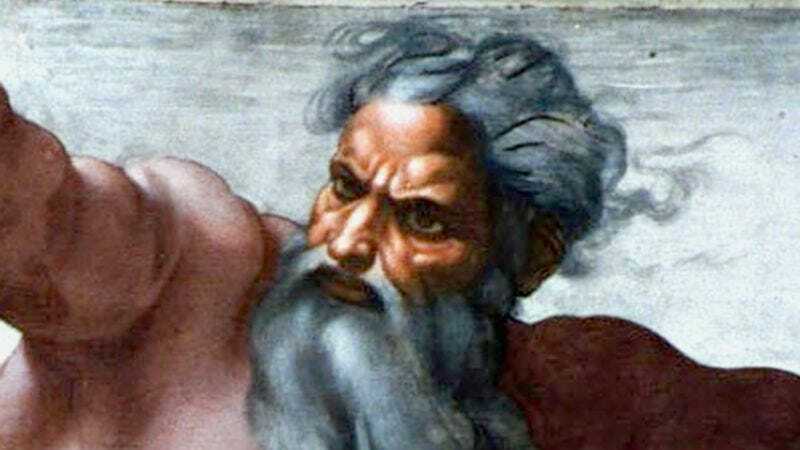 At press time, NCAA officials had announced an eternal ban on God that will prevent Him from having any association with collegiate sports until the end of time.